If you are a student in need of help with your schoolwork, don’t worry. Hennepin County Library’s K-12 Homework Help program provides free homework tutoring and resources at 12 library locations during the academic year, with funding support from Friends of the Hennepin County Library. Each library Homework Help site has one paid lead tutor and four volunteer tutors. The lead directs students to a volunteer who specializes in certain subjects. And while most students are looking for help in core subjects like math, reading and science, tutors can help with any work students bring. The program not only provides one-on-one help, it provides ongoing support and gives kids and teens a quiet place to do their schoolwork. 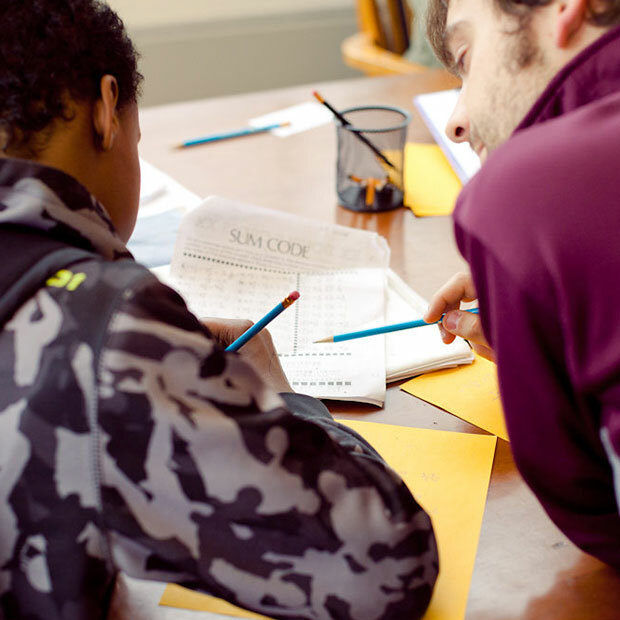 Program data shows students feel more comfortable getting help once they’ve experienced how much the program can do – some seek out the same tutor every week. “I know I’ve worked with at least one student over the past few years who started out with little or no confidence in her ability to do math and feared trying, and now shows none of that reticence,” one tutor said in a volunteer survey. Katherine Debertin, the program coordinator, said for this academic year, the library is pulling together study tool kits for students that will help with their sometimes long homework sessions. The kits will include things like seat cushions, ear plugs, and Google Chromebooks so students can access school files and the Internet while studying at the library. Debertin said connections like these are essential to kids maintaining interest in their schoolwork. “It’s important for kids and teens to keep their momentum in school and have relationships with community members,” she said.